It goes without saying that a functional, attractive website is an important thing for any organization looking to attract investment or retail to their community. We recently worked with the Myrtle Avenue BID in Ridgewood, Queens, NY on a market study and retail attraction program, and as part of this process, we identified what the BID could do (that fit within their budget and staff resources) to get on retailers’ radar and highlight the corridor’s strengths. One of our recommendations was an overhaul of their website and we’re excited to announce that their new site went live last month. 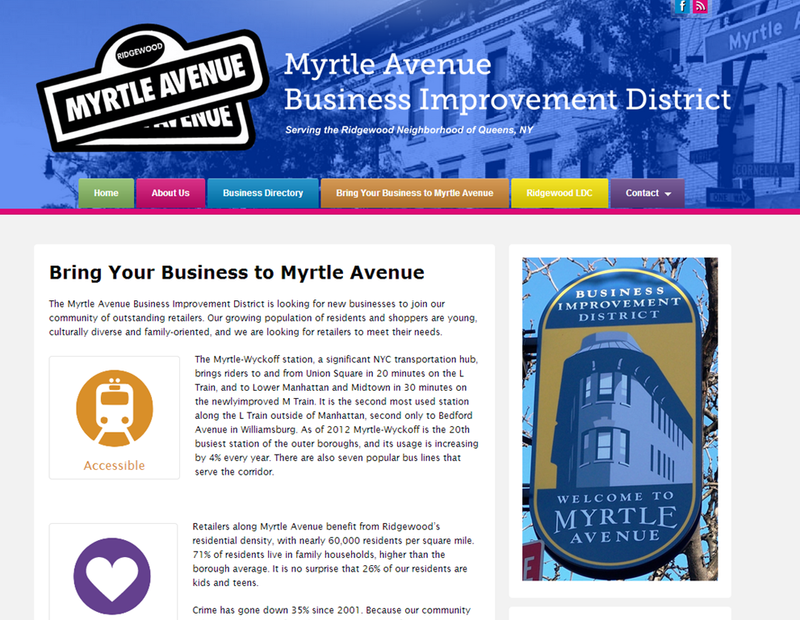 With the help of Main Street Complete, the Myrtle Avenue BID’s website is now bright, easy to navigate, and makes it simple for various constituent groups to find the kind of information they want to know. 1) Take advantage of opportunities to promote your members without having to leave your office chair. Include a dynamic online business directory. Having a good website with promotional features for BID members is a very easy way to show that the BID is working for them. Rather than just display a list of members, include a dynamic business directory. For our BID clients, we always build in an easy-to-update business directory system that allows users to search merchants by business type and location. At the same time each listing includes options to show merchant websites and social media addresses thereby increasing opportunities to drive consumer web traffic to their members. 2) Make it easy for realtors to find you. Include an available properties section. Why not include a dynamic easily navigable real estate section that is easily maintained by your staff? The technology exists and is easily integrated into user-friendly content management systems. 3) Keep it current. Once you have this fantastic dynamic interactive website, make sure you have a strategy in place to keep content current on it. If you do not have it in your budget to have an in-house or contracted content manager/ developer, be certain that your site is built on a user-friendly content management system that makes it easy for your staff to update it and be absolutely certain that you have back-end access from your developers before the initial web project concludes. 4) Integrate social media with your website. Be certain that all of your social media accounts are integrated with your website and prominently displayed on your homepage. More than 30% of all web traffic to websites on average is referred from social media platforms like Facebook, Twitter, and Yelp. 5) Make it mobile and tablet friendly. More than 25% of all web users are searching the web via mobile and tablet and that percentage rises every year. Make sure your designer and developer are creating ‘responsive’ designs that optimally adapt to all screen sizes and devices.